Happy Wednesday! Today I'm showcasing another item I made, though not recently. 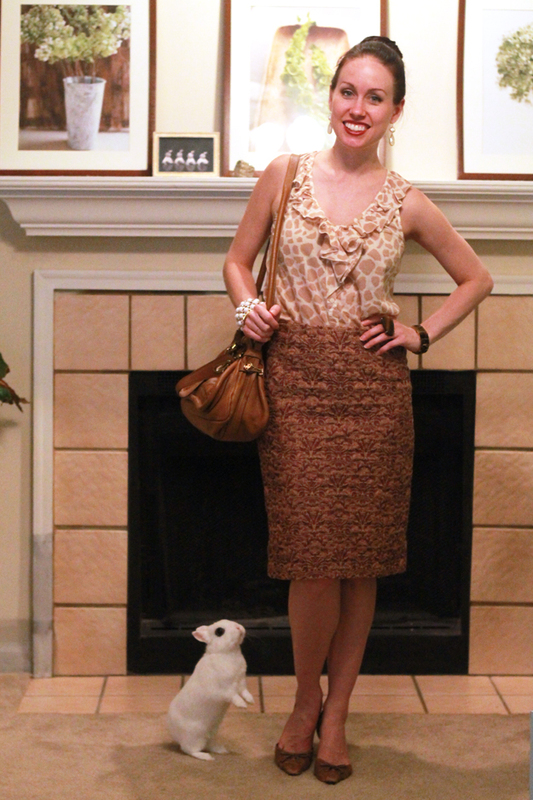 I made this skirt about eight years ago from Vogue pattern 7937. I remember having a drama with the fabric shrinking after washing and dealing with some creative pattern piece placements on the fabric. Ah well, it turned out fine and is still wearable today. Thank you so much for visiting! love the skirt! can't believe you made it! What a great skirt! You are very talented! I love the way you paired it with this animal print top! I own that same top, and I'm always trying to think of new ways to style it. Thanks for the inspiration! You look lovely! And my lord that bunny is adorable! Nice style and that bunny hahaha too cuteee! I love brocade and this skirt is sharp with the kick pleats in the back. Great neutral yet fun color too! Hiya, thanks for the visit and comment on my Blog. This is such an elegant look and it really shows that classic items never go out of style. Well done. Gorgeous skirt! I love the pleats in the back. And can I just tell you I love your sweet bunny. I may or may not have clicked through all the photos with him in them. So cute!! Gosh, your bunny always makes me smile. Nice skirt. I can't believe you made that!! You look gorgeous, Loving the mix of pattern. And your bunny soooo adorable !! Thank you for your lovely comment on my blog!!! Amazing outfit!!! !